Database Systems Corp. (DSC) has been providing computer related technology since 1978 including IVR survey phone systems and outsourcing services. DSC IVR surveys can be created using our desktop software that prompts the developer and creates phone surveys in a simple, but structured fashion. Developers can define both English and Spanish surveys or allow the respondent to select the survey language. Although DSC phone surveys can allow unlimited question and answer responses, using this simple survey generator limits the developer to a total of 99 responses. 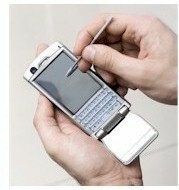 The telephone survey can accept touchphone response or can record each question response for later analysis. Contact DSC to learn more about our complete IVR design and development services and as well as our IVR survey outsourcing services. Building IVR surveys is an easy process using DSC's Survey Builder program. Using a step by step process, IVR survey developers can make selections and choose options from a simple development program. 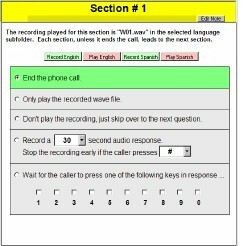 DSC provides a survey recording utility that uses the Windows Sound Recorder on the phone system to record IVR survey prompts. IVR surveys can save either a touchphone response or record a voice response to any question. This information is saved on the phone system. A report is generated automatically that displays survey results. For more detailed information about this Survey Builder, click on the IVR Survey Builder link to obtain a word document describing the operation of this utility. DSC provides its IVR survey clients with the following services and features. These are provided whether the client utilizes outsourcing services or purchases an IVR survey phone system. Contact DSC to learn more about our IVR survey generators and automatic survey solutions.